In at number 91 is another great Larroca cover “shot from the pencils” as they say with no inking whatsoever. Just a nice shot of Rogue and Gambit in a rare “happy together” moment. Check back tomorrow night for number #90 in the count-down of my Top 100 favorite covers. Meh. Another generic cover. It’s a pin-up. A cover should give you an indication of what you’ll find inside, even if just in terms of setting a mood, but the first volume of X-Treme seldom did that. Most of the time, it was just standard pin-up art. Look at the cover for X-Men #1: It’s not a pin-up, it’s a statement. It tells you what you can expect in terms of the mood. 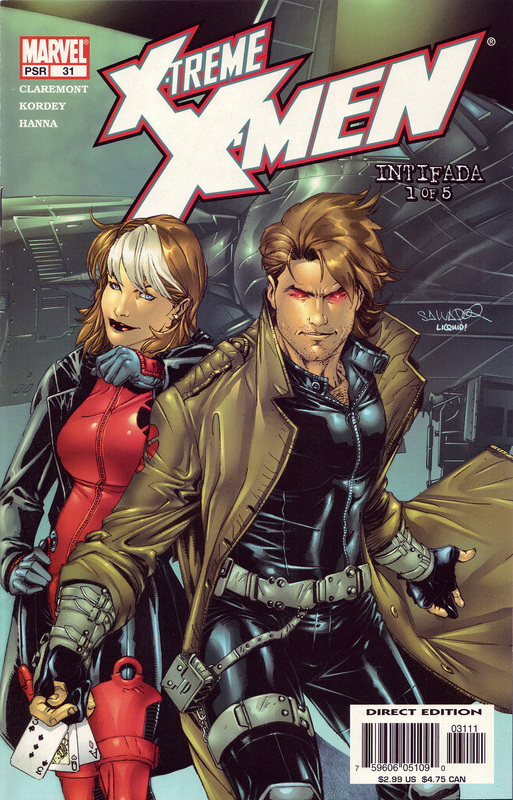 This cover tells me nothing, beyond the fact that Gambit and Rogue will probably be in it. A lot of these more “generic” covers were mandated by Marvel Editorial at the time. Quesada mentioned it in many interviews how he thought ‘iconic’ covers were more appealing to the new reader and attracted them more than more “involved” covers. In general I agree with what your saying in that covers should give you a peek at the story inside but sometimes an”iconic” cover can be nice too. As we get further up the countdown you will see more that you agree with I’m sure!